Access is the major new language series designed with the needs of today's generation of students firmly in mind. 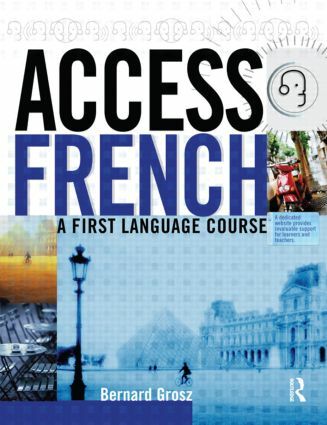 Whether learning for leisure or business purposes or working towards a curriculum qualification, Access French is specially designed for adults of all ages and gives students a thorough grounding in all the skills required to understand, speak, read and write contemporary French from scratch. The coursebook consists of 10 units covering different topic areas, each of which includes Language Focus panels explaining the structures covered and a comprehensive glossary. Learning tips and assessment checklists help students to achieve a sense of autonomy while at the end of each unit, a DÃ©couverte de la Francophonie section presents short texts of cultural interest. Numerous references to web-based activities, which will be an invaluable support to students' learning, add significantly to the course. En route pour le shopping! Tu veux manger au resto? Qu’est-ce que c’est ‘shepherd’s pie’? Il y a un distributeur de billets près d’ici? Pour aller au stade, s’il vous plaît? Cet hôtel a l’air sympa! UNIT 9 A votre santé! Je me sens déjà mieux!